Home > 2014 > April > Help Us Grow the Fossil Fool MoneyBloom! Show those fossil fools we’re not fooling around! 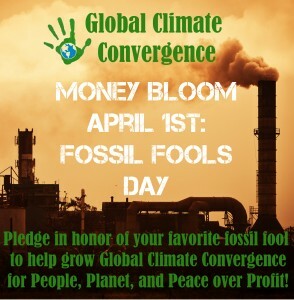 Join the Global Climate Convergence MoneyBloom! 4/7 Update: A HUGE thank you to everyone who contributed to the Fossil Fools MoneyBloom- the money raised will go directly into making Earth Day to May Day 2014 a success! If you did not get a chance to contribute during the MoneyBloom period it’s not too late- click here to donate now and help us build this critical movement for People Planet and Peace over Profit. We need to raise at least $2,500 during this period to power up for Earth Day to May Day 2014. Every donation – large or small – goes a long way! Every dollar brings more resources, communications and networking support to grassroots organizers. Experienced organizers power up their communities. New organizers get started. And the fossil fools are starting to get the message: We’re building an unstoppable movement for People, Planet and Peace over Profit. The Global Climate Convergence currently supports over 100 organizers actively planning or hosting more than 80 events across the country. We provide coordinated action and collaboration across fronts of struggle and national borders to harness the transformative power we already possess as a thousand separate movements. Don’t forget to Tweet and post on Facebook about this important campaign!